Boost your potential winnings on the Melbourne Cup by using your Daily Odds Boost Balance on your selected runner or exotic. Simply add your runner to the bet slip, activate the Odds Boost button and watch your potential winnings roll up! Check out this awesome Bonus Bets offer on Melbourne Cup day at Flemington thanks to online bookmaker Sportsbet. Place a Bet on Races 1, 2 or the Melbourne Cup and if your horse runs 2nd or 3rd you will get a Bonus Bet up to $25. Claim this awesome Free Melbourne Cup Day offer below. The nation stops at 3pm this Tuesday with the running of the 2018 Melbourne Cup, and we have you covered if the horse you back finishes 2nd, 3rd or 4th. Place a Fixed-Odds Win Bet on the Melbourne Cup and if your horse runs 2nd, 3rd or 4th, you'll get your stake back as a Bonus Bet up to $25. Online bookmaker Neds are offering punters an awesome Fat Odds offer on Derby Day this weekend at Flemington. Get Fat Odds on every horse in the first four races at Flemington and get more bang for your buck. Online bookmaker BetEasy have the biggest and best offer for Racing Punters on Victoria Derby Day this Saturday at Flemington. Place a bet on any of the nine races on the quality card of racing and if your horse runs 2nd, 3rd or 4th you will get your Stake Back as Bonus Bets! Victoria Derby day at Flemington Races 3 & 4 Finish 1st or 2nd Get Paid Out As a Winner! Online bookmaker Ladbrokes are offering racing punters an awesome offer this weekend at Flemington. Place a bet on Races 3 or 4 and f your horse finishes 1st or 2nd they will pay you out as a winner! Bookmaker the TAB are offering punters an awesome Free Tipping Competition in which you can win a share in $100,000 this weekend on Victoria Derby day at Flemington. See how you can join the competition and win a Share in $100,000 on Derby Day below. Bookmaker the TAB are offering punters an awesome Free Bonus Bets offer on Saturday at Flemington in which the Victoria Derby headlines the card. Place a Fixed Odds win bet on any of the 9 Races on Derby Day at Flemington with your TAB Account, and if your horse runs 2nd or 3rd they'll replace your stake with a Bonus Bet up to $50*. Bookmaker the TAB are offering punters an awesome Free Bonus Bets offer on Wednesday at Bendigo in which the Bendigo Cup headlines the card. 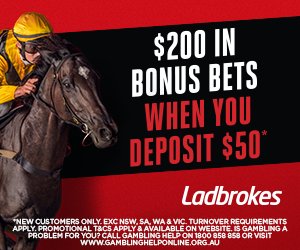 Place a Fixed Odds win bet on Races 1-4 at Bendigo on Wednesday with your TAB Account, and if your horse runs 2nd or 3rd they'll replace your stake with a Bonus Bet up to $50*. Online bookmaker Sportsbet are offering punters a Bonus Bets on 2nd or 3rd offer this Wednesday at Bendigo where it is Bendigo Cup day. Claim this awesome promotion with Sportsbet below. Online bookmaker BetEasy have a Run 2nd or 3rd Special over Races 1-4 plus the Bendigo Cup on Wednesday. Claim this awesome Bendigo Cup day Racing Offer below. Online bookmaker Sportsbet are offering punters a Free awesome Bonus Bets offer on Victoria Derby day at Flemington this weekend. Place a Bet on Races 1-6 on Derby Day and if your horse runs 2nd or 3rd you will get a Bonus Bet up to $50. Claim this awesome Free Derby Day offer below. Online bookmaker Ladbrokes are offering punters Enhanced Odds on Races one and two on Manikato Stakes night at Moonee Valley. Claim this awesome Racing offer below.